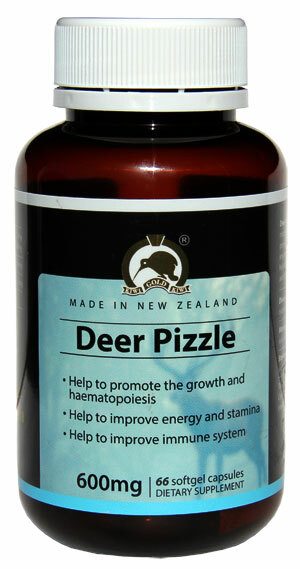 Deer Pizzle is rich source of protein, vitamins, calcium, magnesium, hormones and cartilage. It is efficacious for promotion of growth and hematopoiesis. It helps to improve energy and stamina. its power of recuperative helps to improve the immune system and provides vitality and anti-ageing properties for seniors. This Soft Gel are produced under strict GMP conditions to ensure the highest quality standards are maintained. Take 1-3 capsules daily with meals or as professionally advised. .
Each Soft Gel contains: Deer Pizzle 600mg, Lecithin liquid 14mg, Coconut oil 72mg. No artificial flavorings, preservatives, sugar, salt added. No artificial colourings with capsules. Store below 30º C in a cool dry place. Deer pizzle may be used to enhance sexual performance or improve ones sexual ability. It may also be used in aiding kidney deficiency and improving the function of the kidney. In Chinese Medical Report, deer pizzle contains various minerals, which can be used by our body's circulation systems, especially the kidney.